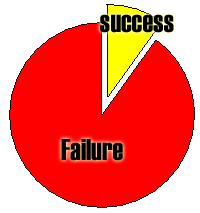 The sales model builds in a 90% failure rate…. and we expect that! We build it right into the entire system: We hire 10X more sales people to get the results we seek, we expect and get 50% longer sales cycles than we could be having, we face objections because people are responding to the sales model itself, we lose clients we shouldn’t lose. And we consider all of this de rigour. This doesn’t need to happen. Sales is just an incomplete model that we’ve accepted as the way to place our products. It works only at the product decision end of the equation (vs. Buying Facilitation™, my model that facilitates the internal decisions end of the equation), with no capability to guide buyers through their tangle of stuff’ that needs to get figured out before they can make a buying decision. This is where prospects go when they say, “I’ll call you back.” They have to make sure all of the people and policies that touch the Identified Problem are in agreement, that old vendor issues and relationships are handled, that historic problems are managed. Unfortunately for us, sales doesn’t help – nor have the skills to help – with this aspect of the seller-buyer equation and buyers need to do this on their own. Unfortunately for them, buyers don’t initially know the route through all of their decisions either. And we meet them far too early in their decision process (we talk about a solution before they know who it will involve, or what changes they’ll need to make internally to bring in something new), leaving us waiting to close and not knowing what’s going on. We assume, falsely, that the match between their need and our solution means they are buyers. So what, we ask, takes them so long to decide? Sales doesn’t offer us the tools to help guide them through the route to all of those decisions: it’s certainly difficult for sellers to understand the buyer’s buy-in issues, management decisions, technology factors. Indeed, because we’re outsiders, we’ll never understand the nuance or relationships or history. But it’s quite possible to have an understanding of the decision making process – the route that buyers must make through their unique decision criteria – and recalibrate our jobs to be not only solution providers, but neutral navigators – Buying Facilitators if you will – much like a buddy to a sight-impaired friend who helps the friend get where they know they have to be but can’t get to their destination without help. By focusing on the buying decision end – the behind-the-scenes issues that need to be addressed to insure buy-in from everyone and everything within the buying environment – of the equation, sales can be closed in months rather than years, weeks rather than months, and sellers can stop wasting so much of their time. And failing so often. Imagine if doctors or baseball players had the same failure rate! For those wishing to read more about this, take a look at Dirty Little Secrets: why buyers can’t buy and sellers can’t sell and what you can do about it.